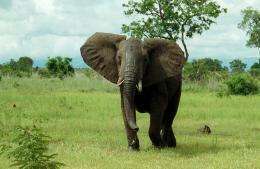 African Bush Elephant in Mikumi National Park, Tanzania. Taken by Oliver Wright, via Wikipedia. (PhysOrg.com) -- Sometimes it seems, nature finds it must resort to some trickery to respond appropriately to changing conditions. Take the elephant, for example. Way back in time, say fifty million years ago, the hulking beasts spent most of their time standing in water, much like hippos do today. But then, over the next ten million years or so, they moved out of the water and began foraging on land. The problem with this though, was that walking on land meant forcing the feet to take up a lot more of the load. Elephants are really heavy after all. So, in response, according to John Hutchinson and his colleagues, as they write in their study published in Science, the big animals began walking on tiptoe, which for the largest of the group meant developing some means of extra support in the back of the foot. So, nature stepped up by causing one of the bones in the foot that normally are used in a supporting role, to evolve to form a sort of toe that works in effect, like a heel on a lady's shoe. Hutchinson and his team explain that the reason this little bit of knowledge has been overlooked for so long is twofold. The first is because the bone starts out as cartilage and only grows into regular hardened bone after many years as an adult. The second reason is because the toe is encased in so much hard foot fat that it’s almost impossible to see how things actually work on a living animal. They point out that such was the thinking that the sixth toe was deemed to offer so little of value that museum workers routinely snipped it off and tossed it away when preparing elephant skeletons for exhibit. Hutchinson has become an expert on elephant feet and as such is now a sort of go-to guy for zoos with elephants with feet problems (which is apparently quite common); so much so that when captive elephants die in zoos the zookeepers quite often lop off the feet and send them to him for study. Because of this he now has what is likely the largest collection of frozen elephant feet in the world with some seventy specimens sitting in various freezers. 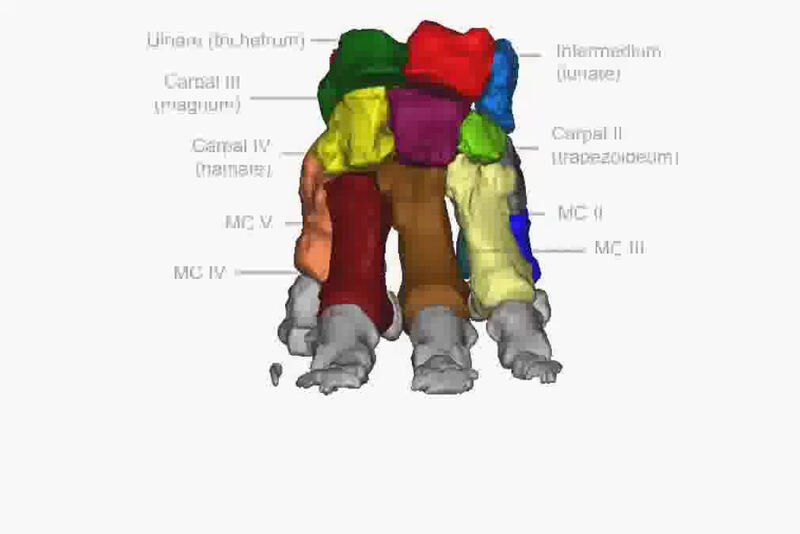 To find out what is really going on with elephant feet, Hutchinson and his team performed autopsies and did CT scans on them, some with weights added to mimic how they should behave under the natural weight of their original owner. In so doing, they discovered that as an animal ages over a several year period, the bone-like cartilage becomes harder and harder, until eventually becoming true bone. It’s at that point that the toe becomes useful as a means of assisting in helping the giant beast stand and walk. What’s most interesting the team says, is that the sixth toe evolved from a sesamoid, a type of bone normally used to support other bones, rather than as a true sixth toe, in much the same way panda’s have evolved a thumb-like appendage to help them eat bamboo. Several groups of tetrapods have expanded sesamoid (small, tendon-anchoring) bones into digit-like structures (predigits), such as pandas thumbs. Elephants similarly have expanded structures in the fat pads of their fore- and hindfeet, but for three centuries these have been overlooked as mere cartilaginous curiosities. We show that these are indeed massive sesamoids that employ a patchy mode of ossification of a massive cartilaginous precursor and that the predigits act functionally like digits. Further, we reveal clear osteological correlates of predigit joint articulation with the carpals/tarsals that are visible in fossils. Our survey shows that basal proboscideans were relatively flat-footed (plantigrade), whereas early elephantiforms evolved the more derived tip-toed (subunguligrade) morphology, including the predigits and fat pad, of extant elephants. 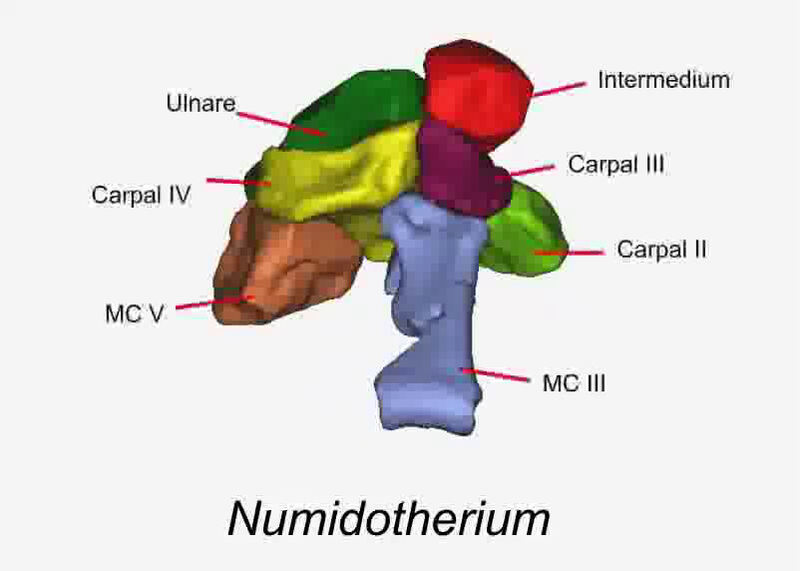 Thus, elephants co-opted sesamoid bones into a role as false digits and used them for support as they changed their foot posture. Are high speed elephants running or walking? What? Why did they start walking on tiptoe? I don't get it. So they could perform in the Ringling Brothers and Barnum & Bailey Circus. Search for 'Ballet of Elephants' by Leda Schubert. Most quadrupeds walk on their toes. It's only strange to us because we walk on our entire foot. Just as runners run on their toes, so do animals, because the tension of the gastrocnemius (and soleus in some animals) makes running more efficient. aroc91 is at least partly right; in this research we chose not to give one definitive answer for the "Why?" question because such queries in evolutionary biology are difficult to answer. But we can certainly address the consequences of such changes in terms of costs and benefits. One benefit is that making the limbs more vertical (including the toes) helps the limbs act more like a column, supporting weight with minimal muscular effort. Bigger animals tend to do this, at a cost of acceleration/maneuverability.